Why does a loving God allow His children to suffer? Why does God allow evil to exist? How do the choices made by Adam and Eve affect us today? 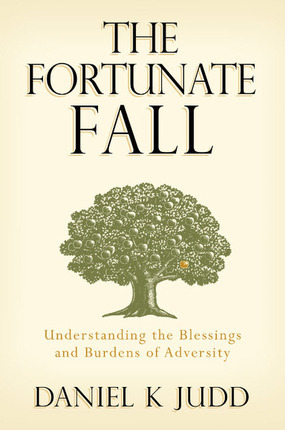 In The Fortunate Fall, author Daniel K. Judd offers answers to these timeless questions. His fresh perspective on the lessons we can learn from our first parents - both from their obedience and sacrifice and from their sins and mistakes - gives us a deeper sense of the purpose of our existence and of the benefit and necessity of the fall of Adam and Eve and the atonement of Jesus Christ. Drawing on his experience as a Church leader and educator, Brother Judd shows us how a true understanding of the Fall can help us heal troubled relationships and respond courageously to evil and opposition. Knowing the right questions to ask and having the right perspective can make an inspired difference in our lives and int he lives of our families. Brother Judd writes, "If we truly understand the Fall, we can better understand the sorrow and suffering that exist in our lives and in the lives of others. Most important, understanding the fall of Adam and Eve helps us to better understand why we need to implement in our lives the ultimate solution to adversity and affliction - the atonement of Jesus Christ." By examining the vital connections between the Fall and the Atonement through the perspective of the restored gospel, The Fortunate Fall offers us answers to age-old questions about evil, suffering, and God's will for each of us. With those answers, we gain renewed confidence to conquer our trials and to realize the redeeming power of the Savior's atonement in our lives. Daniel K. Judd, a professor in the department of Ancient Scripture in Brigham Young University, holds a master's degree in family science and a Ph.D. in counseling psychology from BYU. After teaching in both seminary and institute, he taught in the Family Science department at BYU-Idaho. In 1993 he joined the faculty of BYU, where he has since served as chair of Ancient Scripture. Brother Judd has served in the Church of Jesus Christ of Latter-day Saints as a bishop, stake president, and first counselor in the general presidency of the Sunday School. He is also a member of the board of trustees of LDS Family Services. He has recently been called to serve as president of the Ghana Accra Mission, where he will serve with his wife, Kaye. They are the parents of four children. In this masterpiece Brother Judd thoroughly explains one of the most important keystones of our religion, helping the reader understand the purpose of life, including the role of adversity in our lives. Seeped in references to the scriptures and writings of Latter-day Prophets, Brother Judd not only helps us understand life, but this book is also the most comprehensive guide I have had for understanding some of the main principles taught in the Temple. A book to be considered a masterpiece! I have suffered from many trials in my life and this book puts them into the perspective as something to glory in! We should all walk a little closer to Heavenly and his Son because of this beautiful book.